"HEAT CANNOT BE SEPARATED FROM FIRE OR BEAUTY FROM THE ETERNAL"
The quotes work perfectly for URBAN DECAY NAKED HEAT PALETTE. The palette whose packaging resembles flames of fire worth the beauty of the name "HEAT". Price:- $54. I personally bought from Instagram stores (Nowandwowchennai) in Rs.4900/- . Availability: - Urban decay website, Sephora and many international websites. But as most of the website doesn't ship to India so I ordered from Instagram stores. If you thought our Naked palettes were hot before, brace yourself—because our newest iteration is next level. This is Naked Heat, our most sweltering Naked palette yet. Give in to the heat of the moment with 12 ALL-NEW, can’t-live-without, amber-hued neutrals—including warm browns, burnt oranges, and rich siennas. The most shade-driven Naked palette we’ve ever done, this palette takes Naked in a whole new direction. From a super-smooth red-brown matte and a glimmering copper to a deep, shifty bronze, this palette has everything you need to create sultry daytime looks, intensely smoky night time looks and everything in between. These shades look insanely flattering on any skin tone and talk about HOT. We’re currently obsessed with En Fuego, a matte red, which looks amazing in the crease or on the lid. Ember is our go-to shade for the perfect warm smoky eye. We also can’t get enough of Scorched, a metallic deep red with gold micro-shimmer, and Dirty Talk, a really beautiful metallic burnt red. Every shade in Naked Heat features our Pigment Infusion System™, the proprietary blend of ingredients that gives each shade its velvety texture, rich color, serious staying power and blend ability. Because with shades like these, you’ll want to blend the perfect sunset eye, and our formula makes it so easy to transition shades like a pro. Whether you’re getting Naked in the office, at your significant other’s place or at 40,000 feet, Naked Heat has everything you need, including a full-size mirror and a double-ended brush. We craft our palette brushes with the same care as our UD Pro Brushes. The performance is insane, and they’re some of our favorite tools. The Blending Brush is perfect for foolproof, seamless blending. Use the Detailed Crease Brush to get a precise application in the crease. The palette comes in a beautiful box with the name written on it. The cardboard box had to slide to take out the palette. The palette comes in a sturdy case which is heavy in weight and much similar to NAKED SMOKEY palette (I reviewed it here). The packaging of the palette is worth mentioning. The color of the palette is much similar with the flames of fire. Outside the palette, the name is written in golden which you can feel with finger whenever you touch those words.The palette comes with a mirror and a dual ended brush. The brush is very soft and useful while applying the eyeshadows from the palette. The mirror in the palette actually makes it complete (as few palette don't have the mirror on it for which it is little difficult during touch-up). The palette has strong magnetic closure. Overall the packaging is really nice, attractive, sturdy and travels friendly. URBAN DECAY NAKED HEAT PALETTE is a palette that consists of 12 eyeshadows which are warm tones and more towards orange and red shades. The palette consists of a mixture of both shimmer and matte shades. 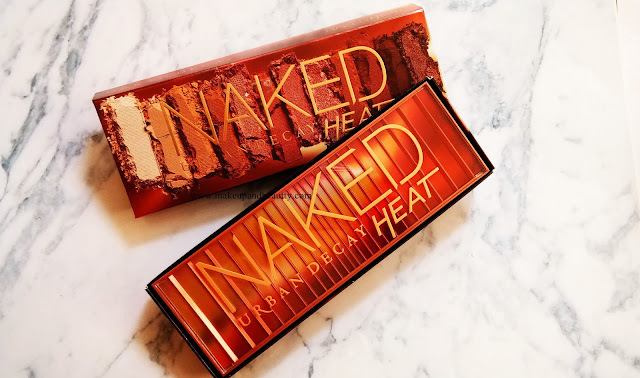 In short URBAN DECAY NAKED HEAT PALETTE is another addition to the "Naked" range of eyeshadows of urban decay. All the eyeshadows are highly pigmented, easily blendable and buttery soft in texture. The matte shades have no fall outs while shimmer shades have 5% of fallout which is very less in amount. The shimmer shades if use with a wet brush then they hardly have any fallout. The eyeshadows stay pretty 8hours+ on my oily eyelids without primer. 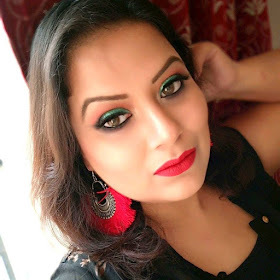 All the shades are perfect for applying on the upper eyelid and on the waterline too as as URBAN DECAY ELECTRIC PALETTE has some restrictions. 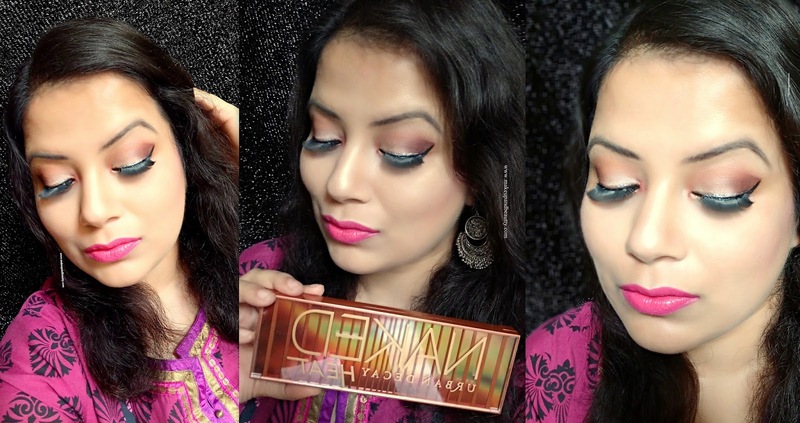 The palette is perfect for Indian skin tone from fair to dusky skin beauties. The choice of the shades in this palette is quite similar to many other palettes. Overall I really like the palette and very happy to include it in my URBAN DECAY collection of the palette. As a beauty blogger I am bound to my reader to give my honest opinion about every product so if you ask me about this palette that "Is it worth buying"? My answer will be "NOPE" just because the price of the palette is very high for which it is considered as a luxury palette. Secondly, as the shades are pretty dupeable one so if you can't afford this one then you don't need to regret about it.As there are many other brands which have similar kind of shades in their palettes. For a comparison purpose here are the pictures of few palette along with URBAN DECAY NAKED HEAT palette which might help you to decide whether you want this palette or not. Here is an FOTD, where I use the palette to create a look. And to see how I create this look, here is the video of it.